This route is easy to describe and easy to find. 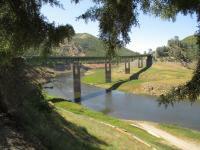 Start out in quaint Coulterville, CA and head south on CA 49 all the way down to historic Mariposa, CA. Beautiful scenery of the Sierras. Mountain overlooks, and the almost never ending sight of twisted asphalt ahead. Any notice of the scenery is secondary to keeping rubber to pavement, as the twisties keep you more than busy throughout the ride. Recommend pulling off at the numerous overlook sites to take in the views. Starts you off full bore in quaint Coulterville, where you ride Highway 49's twisties high into the Sierras and end in the historic town of Mariposa, California. Although the trip is only 26 miles long, it is not for the faint of heart...it includes beautiful views, fueling stations, and 1st gear twisties the entire ride. And of course use caution as the road is nestled in the Sierras, and reaches elevations of 6,000 feet. Great road all-around. No pots, dips, or heavy cracks to sabotage your journey. With smooth pavement the entire ride, you will feel at ease concentrating solely on the ride. The one and only drawback...depending on tire compound, 4-5 rides on this road and you are replacing a rear tire. Coulterville has small country stores and a few historical landmarks. On your journey you will find overlooks and wonderful scenic views. Once in Mariposa, feel free to spend the day window shopping in the numerous country stores lining Highway 140. There are many historical landmarks in this small mountain town, and of course plenty of gas stations to re-fuel for the trip home. on December 14, 2008 1 out of 2 members found this review useful. The only issues with the "Mini Dragon" are too much law enforcement and too many "noobs" crashing. on October 14, 2008 1 out of 1 members found this review useful. We call this stretch of Hwy 49 the "Little Dragon." It's a bit more crowded these days, and the LEO have found it a good place to write up tickets. About 6 miles up Greeley Hill out of Coulterville, you'll find a little gas station which carries 100 octane racing fuel. on March 19, 2015 0 out of 0 members found this review useful. This is my favorite road ever. I've ridden and driven it with different bikes and cars and it always puts a grin on my face. The first time I ever rode it, I didn't know about it, I was just heading to Mariposa for the night. As soon as I hit this stretch of road, I was in the zone and I could think of nothing but the next curve. Pavement varies, but right now it is perfect and very grippy. Police do prowl the road, so beware. on May 12, 2010 0 out of 0 members found this review useful. I have been on this road many times over the years. The best place to start is Oakhurst and follow the Golden Chain Hwy until Grass Valley. It is not a one day trek but well worth the effort. It is one of the richest areas in California history, and there is no shortage of things to see. The entire length of the road is one Historical landmark after another, take your camera, sleeping bag, and tent. You can camp along the way, San Andreas is the best place as it is near the midway point. Roads are fantastic, traffic is not too bad, spring the weather is a bikers dream 70's - 80's. Most likely you will need to make 2 or more trips, there is just that much to see. on September 25, 2009 0 out of 0 members found this review useful. Rode thru on a Monday afternoon without much traffic. Great road and great scenery. on November 13, 2008 0 out of 0 members found this review useful. In addition to Coulterville, there is also nearby authentic Gold Rush Era town of Groveland, with wooden sidewalks, vintage stops, Iron Door Saloon for fun times on weekends with Hotel Charlotte right across the street for a place to sleep with a great breakfast included the next morning. Check out the annual 49er Festival and Chili Cookoff in September for a great getaway weekend trip.